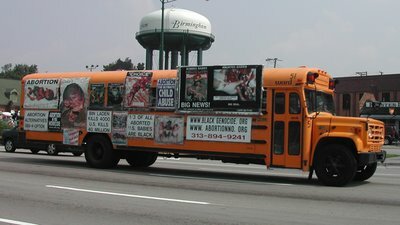 A couple of crazy busses make their way around suburban Detroit with some regularity. They are especially visible during Detroit’s annual Dream Cruise. They make the rounds on Woodward all day, ensuring to horrify the millions of drivers and lookie-loos. They are class-a crazies. And I do love the crazies! 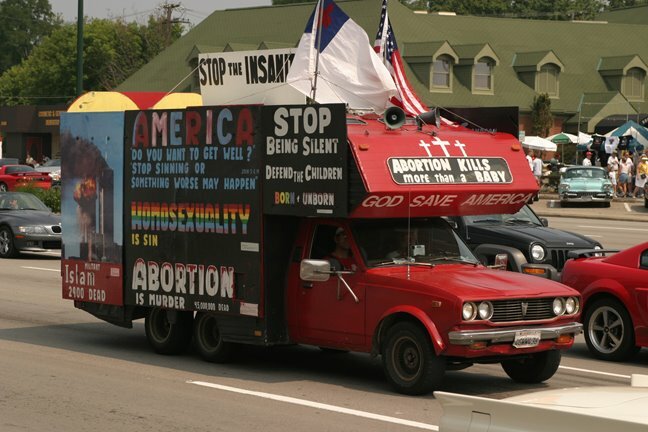 The top bus is my favorite as it conflates all sorts of issues, including 9/11 and abortion. The second one is all anti-abortion so at least they are on message though they say 1/3 of all US abortions are black babies and this connotes a ‘black genocide’–amazing! I’m not sure what Islam or 9/11 has to do with abortion (did one cause the other?) but it’s an impressive, if lunatic, idea all the same. « World’s Largest Cherry Pie-Charlevoix, MI!